It will be a 2000 point generals handbook tournament with units from forge world being allowed subject to having a warscroll. Snacks and drinks will be available on site. Lunch will be provided both days (Subway buffet) as will Saturday evening food. The venue is a Licensed Premises serving soft, hot and alcoholic drinks. As such no outside drinks may be brought into the venue, bringing food/takeaway in is fine and the staff will even help you with places to order from. FREE PARKING all day outside in the venues shared/private car par and next door in the 46 space Council run car park. This purchase is for a virtual ticket and no physical product will be sent out to you. If you discover you can't attend the event we can process a refund for you up to 7 days prior to the event running. 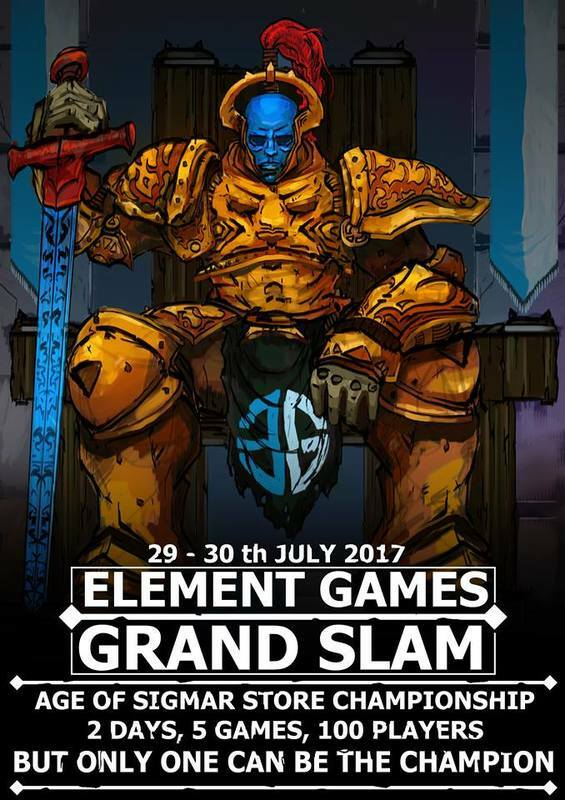 Please email support@elementgames.co.uk. If after this date you find you can't attend we won't be able to process a refund for you as food, venue space and prizes will have been bought and paid for.